We apologise for all the inconvenience caused by our website being offline for much of the past month or so, and thank our many readers who took the time to write to us to express their concern. 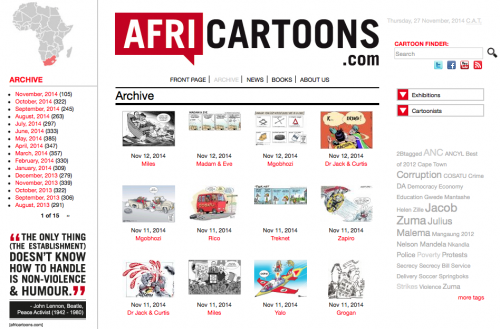 We want to keep the service free for our readers (afterall, our main mission is to spread the good work of our africartoonists as far and wide as we can). And so we're seeking funding for the upgrade, and considering avenues of income (such as selling rights to the cartoons, signed prints and originals, books, t-shirts and other merchandise etc) to cover our running costs. Any ideas or offers of assistance are welcome; please write to me at john[at]digitaljungle.co.za. Meanwhile, we'll be working hard to catch up the cartoons we've not yet uploaded, while keeping up to date with all the latest cartoons. We're also available on our facebook and twitter platforms. Enjoy - it's good to have you back.